Do you have that perfect "go to" cookie recipe that you use when you need to bring baked goods to the school, the church, or maybe a family gathering? These chocolate chip cookies are mine. I did not come up with this recipe but it's one I have had for a long time. I'm sure it's probably the number one cookie recipe on the web, or something like that, but I am here to tell you they are worth making! It makes the perfect chocolate chip cookie so I thought I would share. My favorite way to eat these is with a cup of hot coffee! They are super simple to make as well. My girls love to mix the ingredients and help out when they can. It's a great recipe to use to teach your little ones about measurements and also a love for baking. Not to mention the great memories they will have in the kitchen whipping these up with you! Mix sugar, brown sugar, vanilla, & egg in a large bowl with a mixer until combined. In another bowl mix together flour, baking soda, & salt. Slowly pour the flour mixture into the sugar mixture while stirring. (dough will become stiff) Add in the bag of chocolate chips (and nuts) and stir to combine. 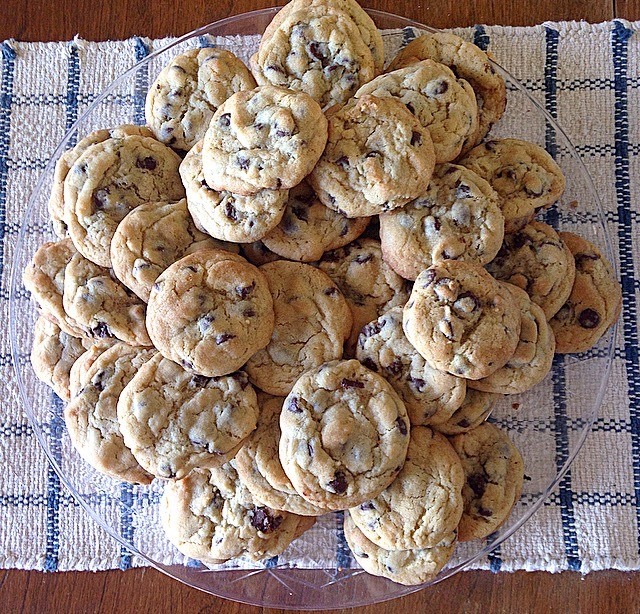 (you may have to use your hands to mix for best results and to insure the chocolate chips spread evenly). Drop by spoonfuls onto a cookie sheet. Bake 8-10 minutes depending on your oven. They should be slightly turning brown on the bottoms when you pull them out of the oven. They will still be a little "gooey" but will harden as they rest. Let them rest for about 10 minutes before removing from cookie sheet. Grab your hot cup of coffee or cold milk for the younger ones and enjoy!